For those yet unfamiliar with Mercedes-Benz Ponton models, this is a good place to become acquainted. First, a quick reference guide. Then, where to get help with a Ponton and some sage advice from other Ponton owners and finally, a buyer's checklist can be found at the bottom of this page. A practical four-door sedan with a four-cylinder engine of approx. 1.8 liters. Single Solex carburetor for the gasoline engines. Bosch fuel-injection on the diesel engines. Fun cars, but a bit underpowered for freeway and regular highway use, especially the diesels. Incorporates Bakelite (an early plastic) for interior window surrounds and the fascia (dashboard). Diesel engine fuel consumption was proclaimed to be 30-41 miles/U.S. gal. With a 14.8 (U.S. gallon) tank, that's over 600 miles between fill-ups. You're not going to believe the diesel's 0-100 km/h (62 mph) acceleration data. How does 40 seconds sound? Some incredibly high mileages have been achieved and documented with the Mercedes-Benz diesel engine. The shorter wheelbase of the four-cylinder Pontons (especially with gasoline engines) can give the car a more sporty feel than the six-cylinder models. A four-door sedan, four-cylinder engine, approx. 1.9 liters. Single Solex carburetor on the gasoline engine. The Bosch fuel injection pump was used on the diesels. Same body as Type 180 with slightly more bright-work body trim located at the base of the side windows. Includes Bakelite window surrounds, fascia and glove box, but also sports a slightly upscale wooden trim strip over the instrument cluster. More spry, better freeway and highway driving. Fuel consumption on the gasoline engines was listed as being about 20-26 miles/U.S. gal. The diesel models are quaint and historic, and may be best suited for the hard-core enthusiast. Popular extra-cost options on the four-cylinder Pontons included radios, and large sliding fabric sunroofs. A larger four-door sedan with a six-cylinder gasoline engine (approx. 2.2 liters). Single Solex carburetor. Good performance. Slightly larger than the Type 190. The body has the longer engine compartment of the Type 220a/220S. From the center door post ("b-pillar") back, it has the body of the Type 190. In other words, more power than the 190, but not as much leg room in the back seat as the Type 220S and 220SE sedans. The 219 features a Bakelite fascia (dashboard) and interior window trim but also has a contoured wooden strip above the instrument cluster (similar to the Type 190). Originally, it was conceived to be the most affordable way to put a six-cylinder Mercedes-Benz sedan into your stable. An admirable four-door sedan with a six-cylinder gasoline engine of approx. 2.2 liters. Single Solex carburetor. More power and a sprightly feeling. Body about the same as the Type 220S. Same amount of body trim as the 220S except the front fender trim is absent. A bit longer than the Type 219 with longer rear doors. Finally, this is a Ponton model with a full compliment of wood interior trim. Fabric sunroofs and radios were popular extras. All models in the range have a large trunk for stowing fitted luggage, which was another extra-cost option. The 220S series includes a four-door sedan, a two-door coupé and a two-door cabriolet. All body styles utilize the same six-cylinder gasoline engine (approx. 2.2 liters) with dual Solex carburetors. Good performance. Top of the Ponton series line. The coupés and cabriolets have the same engine and drivetrain as the sedans, only different bodies, more interior wood trim, leather upholstery and exterior chrome trim. 0-62mph: 17seconds. Top speed: 100mph. Expect to dig way down into your wallet for the coupé and cabriolet when found in good condition as they have more real collector value. As the old saying goes, when the top goes down, the price goes up. Includes a four-door sedan, along with the two-door coupé and cabriolet. Same body styles as the Type 220S but with a 2.2 liter Bosch fuel-injected gasoline engine. Again, lots of chrome, wood and leather interior trim. The fuel-injected Pontons are the rarest of the breed. Same top speed as the 220S models but two seconds quicker from 0 to 62mph. Popular on all Mercedes-Benz Ponton models was the Becker Mexico radio, and the extra large sliding fabric sunroof made by Webasto. Good performance and traditional Teutonic build quality, combined with somewhat exotic styling led this two-seat roadster to become quite popular when it was introduced. Not surprisingly, it continues to have a strong following today. Many specialists and clubs can provide access to parts and technical information. The 190SL utilizes the same W121 chassis and drivetrain as the Type 190 sedan, but the Type 190SL coupé-cabriolet-roadster had a maximum cruising speed of 110 mph because of the tuning done to the in-line four-cylinder engine (approx. 1.9 liters) with twin horizontal Solex carburetors. A canvas cabriolet roof was standard. Popular options included a hardtop, fitted luggage and a radio. Among the most collectible and expensive models in the range. The four-speed manual transmission shift lever was, unlike other Ponton models, mounted on the floor. Uncommon and low production body style variations built for specific markets like South Africa (reference the "bakkie" pick-up), ambulances, hearses and station wagons. These utility vehicles were sent off the Daimler-Benz factory grounds to be finished by smaller, third party coach builders in Germany. Based on both the four and six-cylinder Ponton chassis. So, you've been bitten by the three-pointed-star bug. You saw a nice old Mercedes-Benz classic, and you found out that your object of desire is included in the Ponton range. How much of a risk will it be to own such an old vehicle? Are spare parts available? If so, where can you get them? Does anybody, including your local M-B dealer or independent repair shop, still know anything about these cars? Where can you go for service or technical help if you need it down the road? Relax, don't worry. You are not alone! Mercedes-Benz Pontons owners are fortunate because there are still many places to get new and used spare parts, literature, manuals and technical advice. Even today, the factory in Stuttgart (and the Mercedes-Benz Classic Center in Irvine, California) offers many of these parts for sale, brand new. You may also order parts at your local authorized Mercedes-Benz agent. In addition, there is a healthy after-market global network of specialists who cater to the needs of the M-B Ponton owner. These facts alone should make any potential Ponton buyer feel more comfortable with the notion of ownership. You may decide to perform the maintenance and repair work on your Ponton yourself. This will save you money (not time, most probably) and provide you with the satisfaction of knowing you did the work yourself. There are certainly plenty of sources for original technical documentation, shop manuals, do-it-yourself (DIY) articles, as well as internet-based help forums populated with fellow owners who are both willing and able to help, when you occasionally get stuck in the weeds. On the other hand, as far as out-sourcing the regular maintenance and repair of your Ponton model, you will have varying degrees of success finding a competent dealership or independent shop in your area who is willing to work on your prized possession. A lot will depend on your specific location. In regions where the climate is kind and gentle to older cars, you stand a better chance of locating a good specialist. If there is no specific experience with Ponton models, then perhaps you will find a shop with general experience on vintage Mercedes-Benz or other German vehicles. In some cases, depending on the region, a 10 year old Mercedes-Benz will be thought of as an "old Mercedes." When you walk into the shop with a 50 or 60 year old Mercedes, even some specialty shops will turn you away. So, before you decide to buy, check with your local shops and dealership/s if you plan to send all of the maintenance and repair work out. On the positive side, Pontons are uncomplicated by today's standards and should not pose any unusual challenges on a mechanic familiar with the methodical process of troubleshooting, repair and maintenance. Keep looking until you find the car that's right for you. Everyone has their own requirements for what condition they want the car to be in. Some people want the challenge of a basket case. Some want a car that might need a bit of work. Others, like me (and maybe you), want a car that is a nice driver right now and doesn't need a whole lot to get it into decent shape. The absolute best value almost always comes from a car that the previous owner has done an extensive restoration on. He will never be able to recoup all that he has put into the car and, if he wants to sell it, will have to sell it at what the market will bear, which is usually a fraction of what he has spent on it. As such, these cars will be at the very top end of the asking prices, but they will generally be a car that will cost you little to maintain, may actually end up being cheaper in the long run and will probably hold their value pretty well if you keep it in good condition. If you decide to get a car that needs some work, please pick one that needs engine work and not rust repair. Once rust begins to gain the upper hand, repairs can get very expensive very quickly. Engine work on the other hand will usually have a known cost. I strongly recommend that you also have someone who knows these cars do a pre-purchase inspection for you. Best is probably to pay someone $100 or so to get it on a lift and check the car thoroughly to find any hidden problems. Depending on where you live, you may also have the benefit of living near a whole lot of Ponton owners who might be able to take a look at a prospective purchase for you. If possible, drive the car. It should be smooth, including the diesels. Listen carefully to the engine. It should be smooth, no clicks or clacks or squeaks or squeals. During the drive, there should be no unusual noises from the engine, transmission or rear axle. They should all be almost silent except the engine which makes the usual type running noise. On a start does it shudder or shiver? At low speeds, next to brick wall, are there any squeaks or squeals or grinding noises from the wheels or drive shaft? Almost all mechanical parts are available, some body parts are available, some new and some used. Chrome trim is very hard to find in any condition. 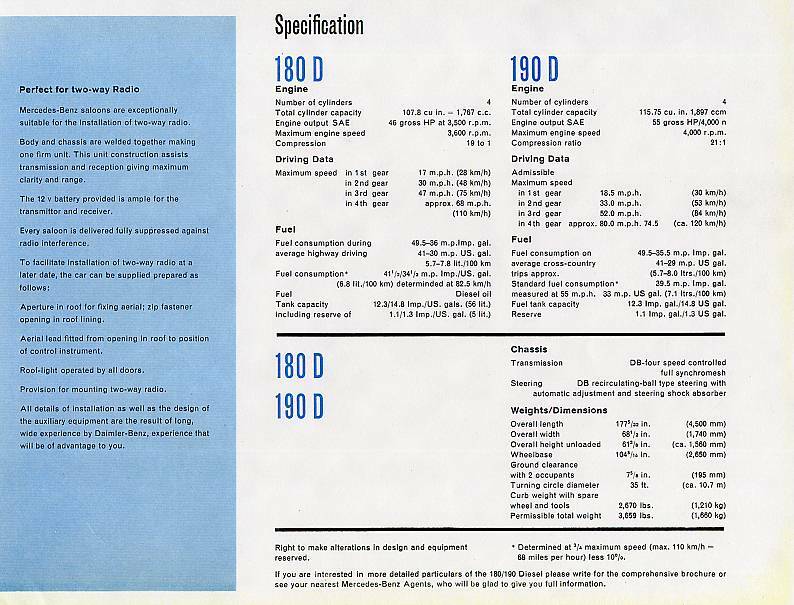 The original version of the Mercedes-Benz Ponton buyer's checklist was compiled in 1996 by Len Sokoloff with a lot of help from Ray Ilich and Ron van Seventer. It helped Len make an objective analysis of the 1959 Type W180 220S cabriolet he found for sale at that time. It must have worked, because he ended up buying the car and has been enjoying it ever since. Some items on the checklist will only be found on the Type 220S cabriolet model. As time permits, this list will be developed into a guide that will include tips for buyers of other Ponton models, including diesels. When ever possible, the list will be made more specific with supporting text, hyperlinks and photographs. This way, potential buyers of any Mercedes-Benz Ponton model may use this as a reference before they reach for their check book and take the plunge. On July 20, 2008, Lenna Winther-Saxe of Fresno, California provided a better organized version of the Buyer's Checklist. The new document replaced the plain text version that was originally found on this page.